Learn how to format a date field in MS-Word while doing Mail Merge. 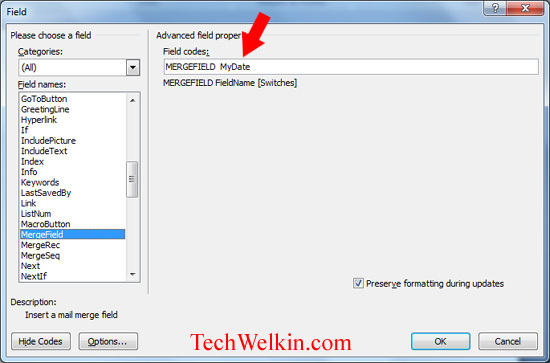 You can easily have the date formatted as you wish using field codes and switches. MS-Word, the word processing software from Microsoft Corporation is often used by individuals and institutions to create and print personalized letters in large quantities. For this the Mail Merge feature of MS Word is used. Suppose you want to print one thousand letters wherein the letter text remains same but recipient name and address and date changes every time; in such a scenario, mail merge comes to your rescue. When you do Mail Merge and if you are using a date field of mergeformat, sometimes MS-Word picks date field from source and prints it in an unwanted format. But, thankfully, we can change the format of date to suit your purpose. Select the date field that you have inserted in your document. If there is anything after the field name, just delete that. Click OK and the format of your field should get changed to the one whose switch you’ve just used. Besides these, you can create any of your desired codes by rearranging these switches (d, M and y). For example, you can write \@ “MMM d yyyy” to format date like Aug 5 2013. Remember: “m” is used for minutes in a date field. For month, it is capital m (M) that you should use. I hope it was useful for you. Thank you for using TechWelkin. Hello, i want to print date as “25TH January 2018” in merged file but it prints 0 instead of H. Please suggest how to correct it. I think that we would correct it as text from the Excel file. I assume that (i) cell A2 contains the date data that you wish to format (e.g. 01/01/2018), and (ii) cell E2 will contain the result of the new format. Then, you will find that the date will be formatted and shown in a new form. Step 2. In the letter (opened in MS Word), input the merge field named “date of execution” into the letter. Lovely bro, you are awesome… Keep up the good work. but when I go into the merge letter template, Edit Field and then paste this for Field Name: NLCURRENTDATE \@ “dddd, d MMMM yyyy” and click OK, it does not save the format. Should I have the box “Preserve Formatting During Updates” checked??? Basically, my issue is that it is not changing the date to the format I desire when I create the merge letter using the template. Very helpful tip. I’ve used this over and over. This is because of wrong date format. Take right click on the cell with date and select Format Cell. A box will and and here you can select the correct format. Hi, by using Alt + Shift + d shortcut date is being displayed in MS Word, but it is displaying date in month/date/year format. Could please guide me how to get it corrected to date/month/ear format? Hi Rahul, Press Alt+N+D to bring up Date and Time Format box. Select the format you like and then press Alt+D to set that format as default. That’s it. Next time when you’ll press Alt+Shift+D the date will be inserted in new format. I hope this helps you. Stay connect with TechWelkin. I have tried this over and over again, and it works for all of my fields except 2 – which the data continues to show up as 5 numbers – Feb 25, 2000 is showing up as 36581. Hi Katherine, if it is showing a random number instead of formatted date, I guess you should check the switch you’re using. Especially check the type of quotes. If you’re copying the switch, I would suggest that you better type it yourself. Copied text may have different quotes than plain quotes.